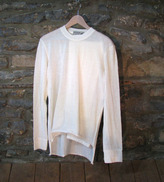 These alpaca long underwear have been proven to be a top performing set. This two piece set is true to alpaca elegance by being light weight and airy, providing hours and hours of breathable warmth and comfort. This set makes the perfect gift and a "must have" for our Canadian winters. Please note: this popular item is difficult to import, and we have a waiting list. Please contact us for details. 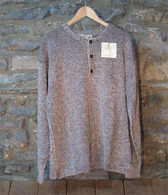 This 100% alpaca camel textured knit sweater has three top buttons for closure. This is the perfect unisex sweater. This traditional handknit 100% Alpaca hat is a must for the cooler weather. Available in snappy natural variegated tones of beige and light gray. These children's acrylic sweaters are made in Peru. They come in various colour combinations and are available in sizes 2 - 8. Inquire about colour and size availability. Prior to ordering, contact us for available sizes and colours. This woman's Town Coat is sleek and stylish in the true tradition of refined design and function. Offered in Classic Black with side slit pockets and accent band with button at the wrist. 75% Baby Alpaca/ 25% fine wool. Satiny smooth lining. The women's 100% Baby Alpaca Cable Pullover will be your "go-to" choice time and again with the delicate cable pattern and light, fluffy feeling of pure comfort. V-Neck. Please check for colour and size availability. The subtle hues of denim blues, charcoal and silver form a striking traditional pattern crafted by the artisans of this rich cultural area in the heart of Peru. Wrap yourself in the warmth and comfort for any occasion! This unisex vest runs in men's sizes. Ladies order one size down. This vest is available in charcoal grey, chocolate brown and a golden fawn. Please inquire about sizes and colour choices to see what is currently in stock.